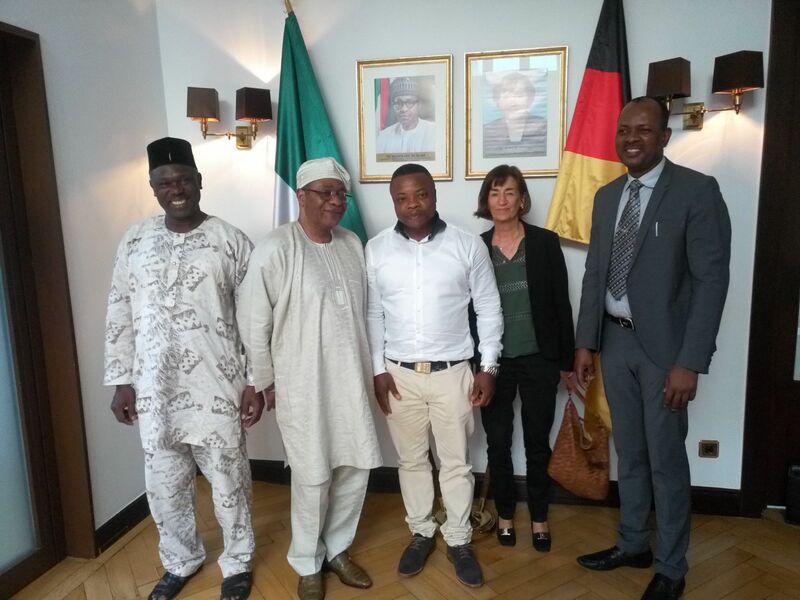 As it is in Ehizoya Golden Entertainment e.V culture, the team presented this year’s NFFG & NEGA awards projects to the new Consular General at the consulate of the Federal Republic of Nigeria, Frankfurt, Germany. 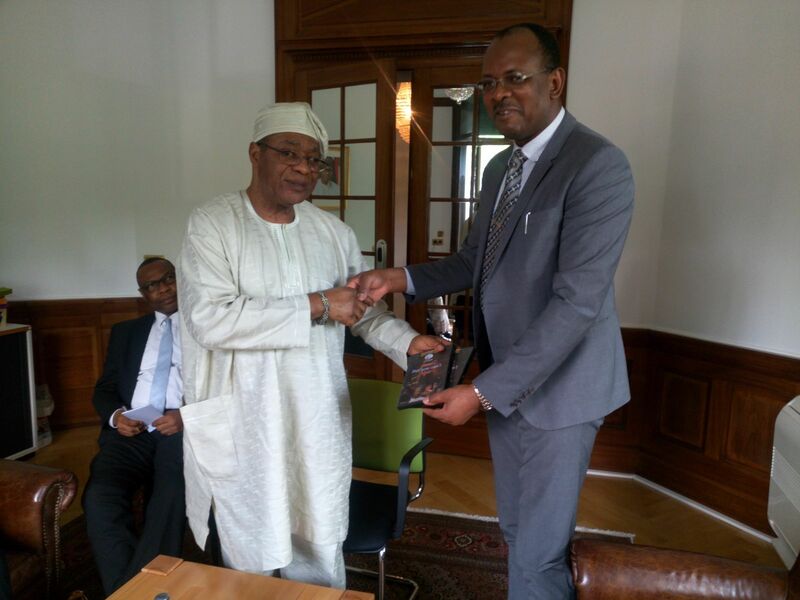 This was during a courtesy call on His Excellency CG Mr. D. O. Falowo. Briefing His Excellency about the upcoming Nollywood – NFFG and NEGA events in general, which is meant to promote Nigeria’s image and integration values in particular in Europe via Nollywood movies produced in Germany by the president of Ehizoya Golden Entertainment Mr. Isaac Izoya – Cultural Ambassador, he appealed to His Excellency CG Mr. D. O. Falowo to continue supporting the Nollywood projects by fully participating in both the planning process and the execution of the events/programme. He urged His Excellency to endeavour in attending both the movies screening and to personally extend invitations to other Diplomatic Corps to also attend both the screening and the NEGA gala-night like his predecessors, which will go a long way in lifting the image of Nigeria to a greater height in Germany. The financial burden of this project is enormous and Mr. Izoya, the event Director, reiterated that his organization will appreciate it if His Excellency could use his good office to relieve us that burden by assisting us financially – directly or indirectly for the continuity of this viable project, he requested. Obviously, this year gala night is going to be special as we are expecting several Diplomatic Corps, VIPs from Abuja, Ghana, UK, USA and His Excellency involvement to make these guests feel at home. Mr. Izoya requested the Consular General to particularly help him thank members of his team in general and those that came with him whom are Engr. 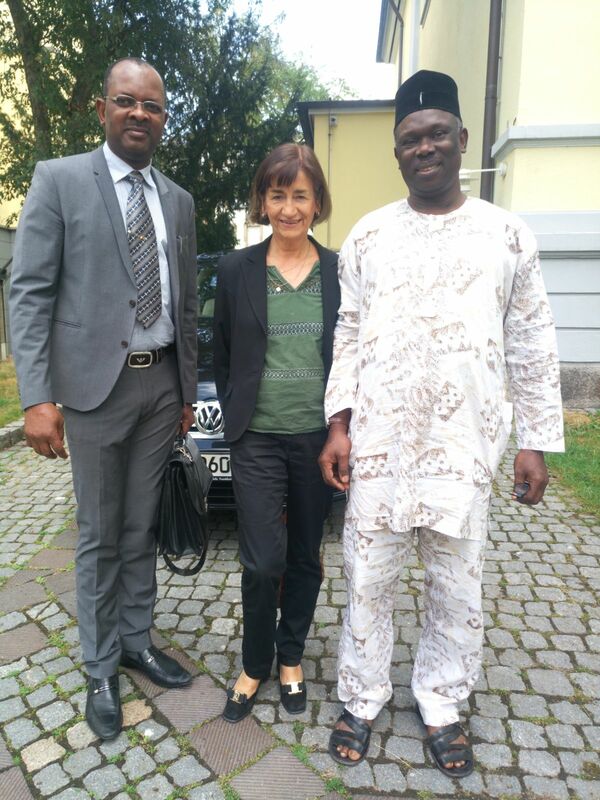 Iyamu – The president of Nigeria Community in Hessen State, Ms Heidi Ivangs-Kariukiour, reliable translator and Mr. Edward Jokolo our welfare officer and to others that are not here today due to their tight schedules. Without them, the success so far wouldn’t have been possible. In response, his Excellency, consul General D.O. 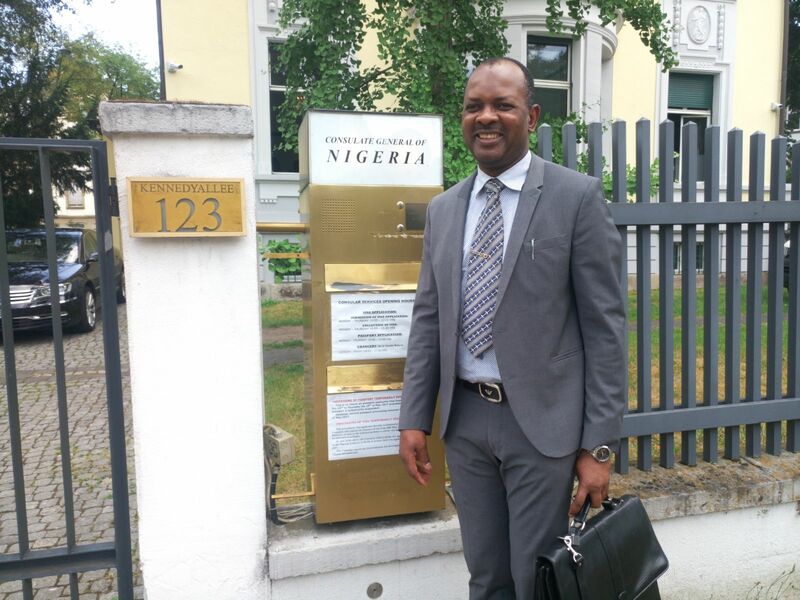 Falowo said “I can’t wait to witness the event because I heard so much about it when I was still in United States of America before coming to Germany. I was aware when Her Excellency Senator Danzilla James from Atlanta Georgia and Dr. Queen Blessing Itua came to receive their awards respectively some years back. They came back to United States then singing praises of the event generally”. “You could then imagine how I felt when I was posted down to Frankfurt. We are here to support viable projects of this magnitude which is very good for our country’s image”. Nigerians are making waves in different fields of human endeavours but we lack powerful media platforms like CNN and BBC broadcasting outlets to blow our trumpets which is one of the advantages the West have over us. “Thanks to Nollywood for serving as our local voice to portray the good image of our country and thanks to Ehizoya Golden Entertainment e.V for these your noble projects via Nollywood telling our original stories in this part of the world. It’s our duty to support such project and we will support you morally but sadly, not with finance because we are financially handicapped”. “Kindly keep us posted regularly and we will surely be there for your organization in our little capacity. It’s a promise”, he added. “Thank God you are here with some of your formidable team members like Engr. Iyamu whom I want to particularly beg to help me organize a meeting between my humble self and the Edo people in this city. I love to meet with them to exchange ideas affecting the image of our beloved country especially, to discuss a hot subject, human trafficking. We must collaboratively fight to stamp it out. Meeting with Edo community is my top priority”, he re-emphasized. “I am the president of Nigeria Community not Edo community. I don’t represent a section of Nigeria because I believe in one Nigeria though I am a typical Edo man. Nevertheless, I promised to help arrange a meeting as requested “, Engr Iyamu concluded. Ehizoya Golden Entertainment e.V, is the organizer of Nollywood film festival Germany – NFFG, a viable platform designed for Nollywood (Nigerian/African) filmmakers to showcase their movies to Europeans and Nollywood fans in the diaspora – (a confirmed educational tools of learning African culture by African children in the diaspora) and Nollywood Europe Golden Awards – NEGA, designed to honour Nollywood stakeholders, stars, comedians, musicians (both in Africa and in the diaspora) which has also been expanded to recognize the artistic bias of outstanding Diplomatic Corps, politicians and businessmen and women both in Africa and beyond but whose actions in the area of culture and tourism sector, have directly or indirectly impacted upon Africans and other continent outside the scope of Africa countries. 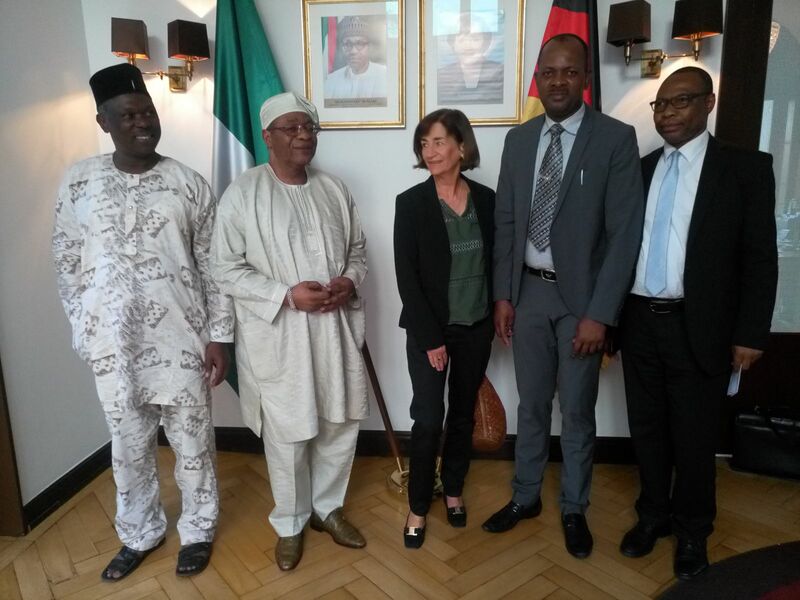 The Nollywood Events (NFFG &NEGA) are organized by a consortium of renowned Europe-based African entertainment promotion outfit, Ehizoya Golden Entertainment e.V, in alliance with Consulate General of the Federal Republic of Nigeria in Frankfurt Am Main, Germany. Stadt Frankfurt Kulturamt (Ministry of Art/Culture – Frankfurt), Hessen State Filmforum Höchst VHS-Frankfurt Am Main, The Office for Multicultural Affairs (Amt für multi culturelle Angelegenheiten – AmkA), Ethiopian Airlines and the Nigeria community e.V, Frankfurt, Germany. This year’s event is scheduled between 8 – 9 September, 2017 in Frankfurt am Main, Germany. Two movies scheduled for premiere this year are DIPLOMATIC STRINGS and DERANGED. Time: 6PM; Premiere of – DIPLOMATIC STRINGS (Isaac Izoya) shot in Frankfurt and Lagos and produced by Isaac Izoya. Time: 10 PM Till Dawn. Time: 2pm prompt: Premiere of – DERANGED (Nadia Buari) shot in Ghana. One of the outstanding movies to watch out for this year during the festival is CANDLE IN THE WIND by (Abdul Salam Mumuni) shot in Ghana among others. NEGA GALA – NIGHT AFTER PARTY with live stage performances by Nigerian best comedian KENNY BLAQ and Hip Hop star ZEEZ also from Lagos, Nigeria. Also expected are local based artists Tu-Brain and Shaba among others. As hallmarked since its inception, may we re-assure our Nollywood fans and followers that their presence at this year NFFG & NEGA awards ceremonies will be in company of distinguished personalities in all fields of human endeavour from Nigeria, Africa, UK, USA and beyond, are invited to grace the occasions. Nollywood’s personalities nominated for 2017 special edition are Hon. Barrister Solomon Dalong, Minister for Youth and Sport, His Excellency Amb, Abdul Bin Rimdap retd, His Excellency Ambassador Habib Baba Habu, Hon Barr Rita Orji – Committee on Diaspora Affairs, Emeka Ike – CEO of Nollywood Television Abuja and the President of the Actor Guild of Nigeria (AGN), Holland-based Chief Editor of The Voice magazine Mr. Elvis Iruh, Ghana movies icon Nadia Buari, Ghana based producers, Sunshine Olawore and Abdul Salam Mumuni, Mr. Abidemi Dairo – Channels Television broadcaster – Lagos, Nigerian best comedian – Kenny Blaq, Nigerian Hip Hop star DJ Zeez. We are pleased to inform you that they have all agreed to join us in Frankfurt, in a beautiful and colourful ceremony with special musical performances by Nigerian Hip Hop star DJ Zeez and Kenny Blaq – stand-up comedian among other side attractions by Tu-Brain and Shaba etc.